Start the login process with Session -> Login. 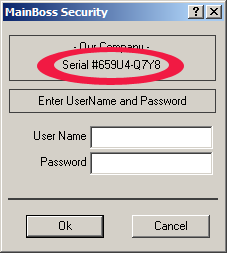 This is not a license key, but a special number that is only used for emergency passwords. Tell this number to MainBoss Support. MainBoss Support will give you an emergency password. Write this down. Using Session -> Login, start a new login to MainBoss. Delete any contents of the User Name field, so that it's blank. In Password, type in the emergency password that you received from MainBoss Support. MainBoss will go into a special mode that only lets you set a new ADMINISTRATOR password. 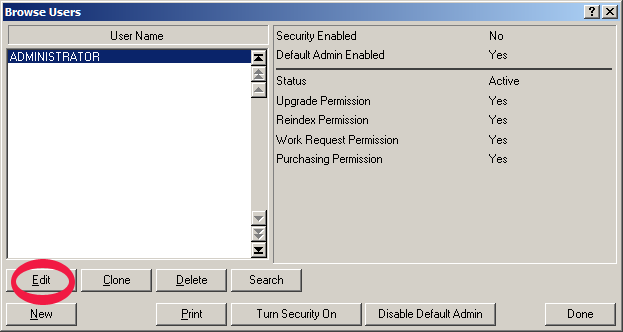 Select Administration -> Security -> Users from the menu. MainBoss will open a window where you can enter a new password for ADMINISTRATOR. Remember to click Save after specifying the password. In the User Name field, type ADMINISTRATOR. In the Password field, type the emergency password you got from MainBoss Support. MainBoss will open a user browser. Click on ADMINISTRATOR in the browser, then click the Edit button.